..would still taste as sweet. Following on from my trip to the Washington Summer Fancy Food Show, I have yet to add any new updates since my first post on the subject, so I’m typing this while sat on the naughty step. So what does the above title refer to? A new wave of sweet snacks that are trying to expand the snack/ biscuit category. From an American perspective, I can see the attraction: the biscuit and crisp (or cookie and chip) category is already quite a crowded market place. While there is innovation happening, such as using a whole variety of fruit and veg for crisps, or unusual ingredients (lentil crisps anyone? ), achieving brand stand out and catching the imagination of buyers in these areas can be difficult. A New York institution, Seth Greenberg offers a range of mail order treats. He is most famous for his brownies, which were featured as the best in New York. But his daughter ate only the crispy edges. “Brownie Heaven!” she called them. So Seth created a recipe that baked only the crispy edge of a pan of brownies without the brownie. 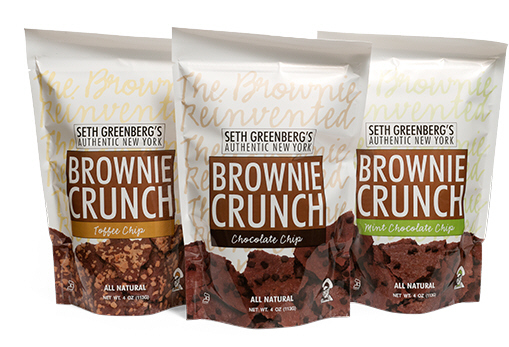 Studded with chocolate chips or toffee chips or bursting with mint, Seth Greenberg’sAuthentic New York Brownie Crunch is a unique dessert snack. Like many brownie aficionados (and Seth above! ), Sheila is particularly fond of the crispy edges. In fact, on many an afternoon she would walk through the bakery gathering the brittle batter off the sides of the sheet pans as the brownies cooled in their racks. It had that same rich chocolate taste, but with an amazing crunch. She has now developed this into three flavours – Toffee Crunch, Peanut butter and Chocolate Chip. Clearly I’ve saved the best till last. Set up by Pastry Chef Joanne Adirim, Hannah Max originally launched to serve the catering and retail trade, offering ready made pies, cakes and tarts. They have now launched two different lines that are targeted at the snack and indulgence markets. 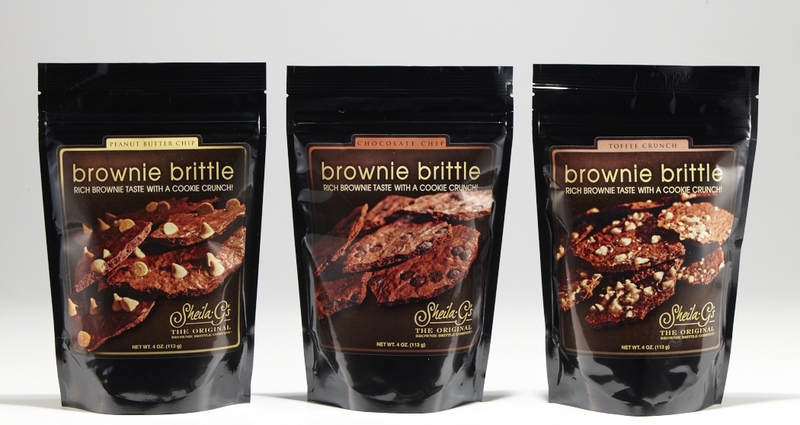 Like the brownie crunch and brittle above, Hannah Max targets the crisp/snack market with four different cookie chips – thin, crisp biscuits with the crunch of a crisp, but the taste of a biscuit. Flavours include original brown sugar, chocolate chip, cinnamon sugar and salted peanut butter. All firm and familiar American favourites. 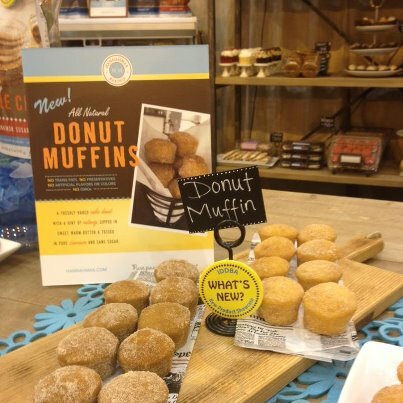 But my favourite in their new launches, were their Donut Muffins: essentially soft cake like muffins – that taste like sugared donuts. Genius.